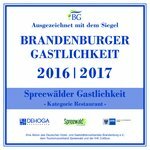 Quality seal "Brandenburger Gastlichkeit im Spreewald 2018/2019"
Also for 2018/2019 the "Willmersdorfer Hof" was awarded the seal of quality "Brandenburger Gastlichkeit im Spreewald 2018/2019" by the "Deutscher Hotel und Gaststättenverband Brandenburg e.V"
This stands for tested quality of food, service and space in our restaurant! 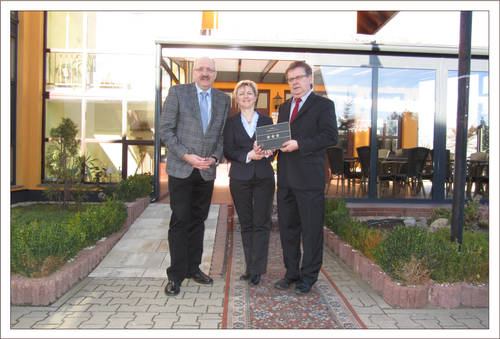 Quality seal "Spreewälder Gastlichkeit 2016/2017"
Also in this year the "Willmersdorfer Hof" has been awarded the seal of quality „Spreewälder Gastlichkeit 2016/2017“ by the "Deutcher Hotel und Gaststättenverband Brandenburg e.V. Now it is official: Our hotel received the 3-star classification as "accommodation for high standards" from the "Deutscher Hotel und Gaststättenverband Brandenburg e.V. We are delighted that the commitment of the entire team in terms of hotel and service quality has been rewardedwith this great result. 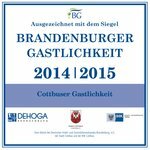 The "Willmersdorfer Hof " has been awarded the seal of quality „Brandenburger Gastlichkeit 2014/2015“ by the "Deutscher Hotel und Gaststättenverband Brandenburg e.V. This stands for certifed quality of food, service and premises in our restaurant.